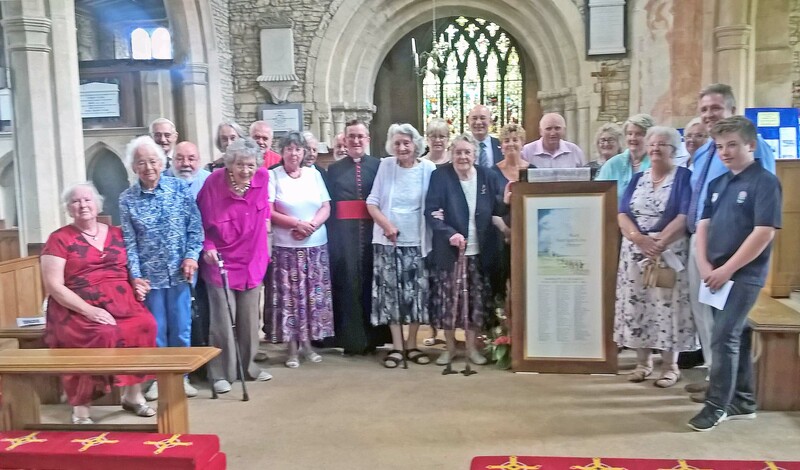 On 26th July 2016 a newly commissioned Roll of Honour, listing the names of a further 119 Hanslope men and women who served in World War One, was dedicated. 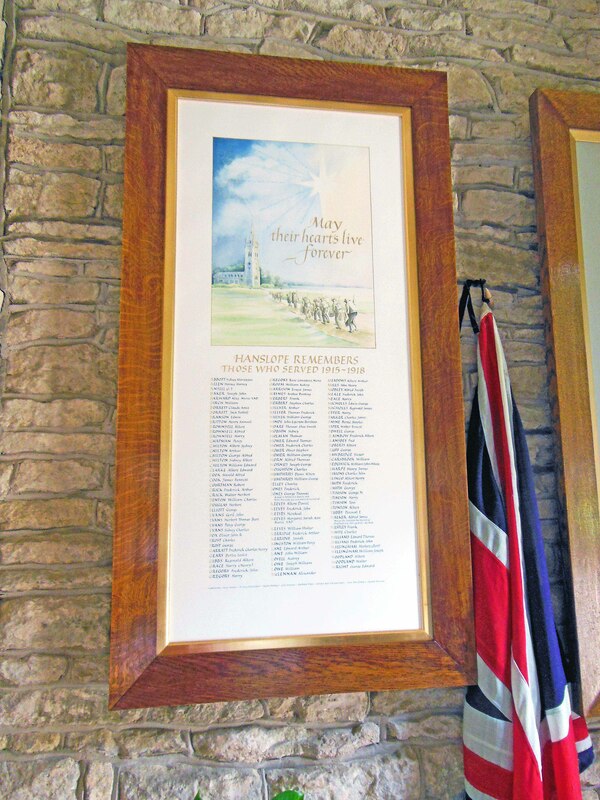 It was placed alongside the original Roll that had been created in April 1915 in the porch of St James Church. We hope that these represent now a complete record. The total number of people is 199, of whom 22 men died. Jan Mehigan BA, Cert Ed, HFCLAS, FSSI, Dip.SBA, is an Honoured Fellow and Trustee Chairman of the prestigious Calligraphy & Lettering Arts Society and a Fellow of the Society of Scribes and Illuminators. 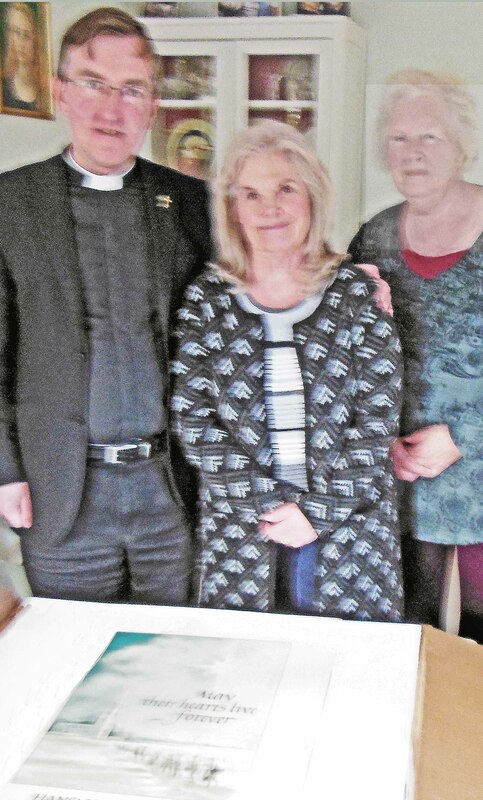 She is one of the country’s leading specialists in illuminated artwork; writes books; and teaches at specialist colleges. Her work is in, amongst other places, the Fitzwilliam Collection of Contemporary Calligraphy in Cambridge. She lives and works on Hayling Island, Hampshire. The bespoke new frame was created by Michael Dolling using solid oak, acid-free back boards and ‘Clarity’ glass (which is non-reflective, water white, recommended for conservation and museum use.) He is an Antiques and Fine Furniture restorer based in Norfolk. It is as close a match as possible to the frame for the original Roll which Michael restored last year. We owe a great debt of gratitude to The Heritage Lottery Fund for their grant in making this work possible. 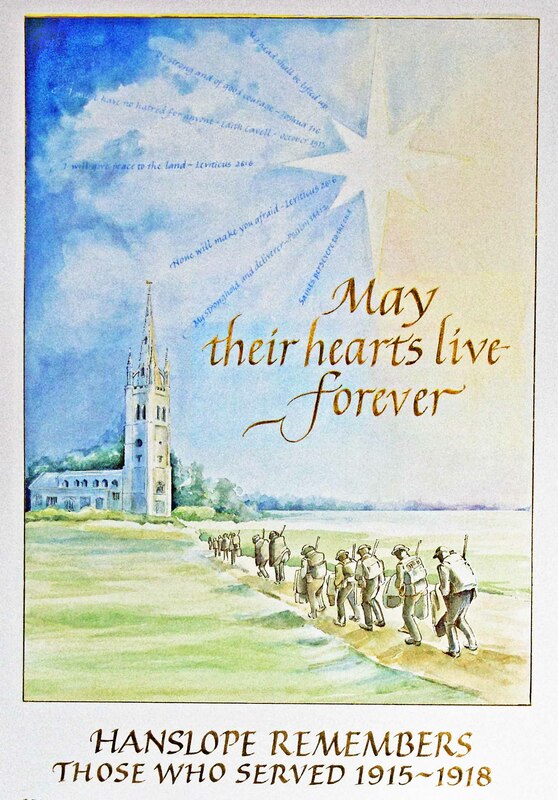 Also to the website, Buckinghamshire Remembers. 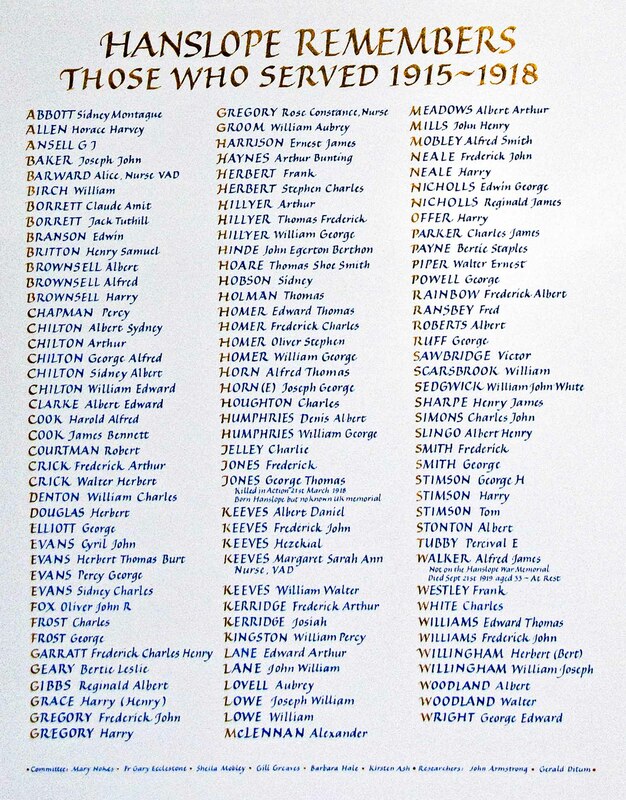 Peter and June Underwood and Clint Lawson have worked tirelessly for a number of years to create an extraordinary site which records almost all the men who served in WW1 from every parish in Buckinghamshire. 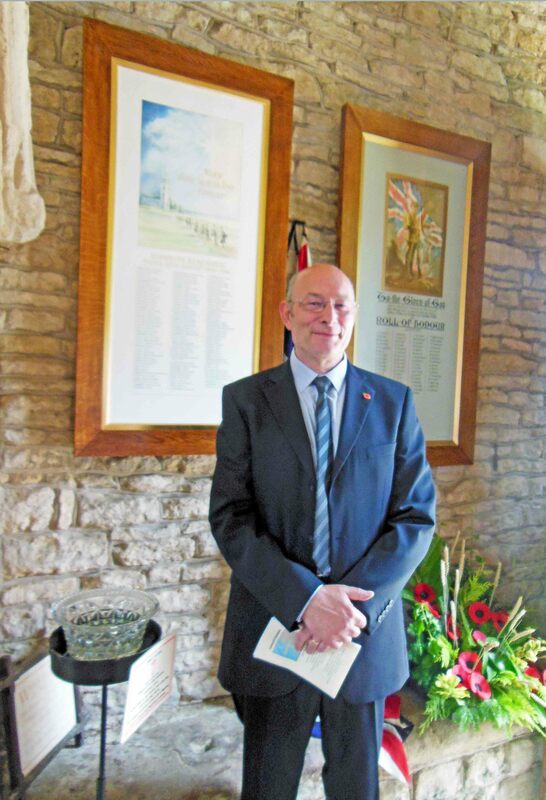 Hanslope WW1 Commemoration Committee is a sub-committee of the Hanslope & District Historical Society. 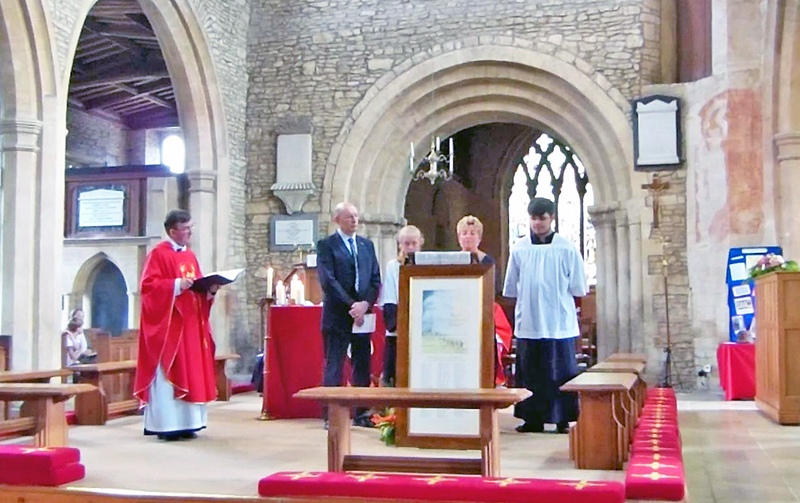 Members include representatives from the society, Hanslope Parish Council and St James Church.